Patty Zeitlin is the author of short stories, books, seven children’s musicals, seven recordings of original songs for children, and one of for adults. 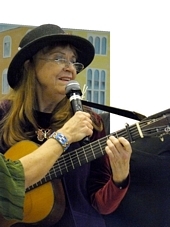 Her songs have been performed and/or recorded by Pete Seeger, Arlo Guthrie, Marni Nixon, Fred Penner, Sharon, Uncle Ruthie, Lois and Bram, Mister Dressup, Tony Saletan. Tickle Tune Typhoon, and others. Mister Rogers and Malvina Reynolds, as well as many others, have been enthusiastic about her work (See reviews section). To learn more about Patty's awards, click here. Patty has written Winnie the Pooh scripts (on language development) that were produced by Walt Disney Studios and distributed to elementary schools. She was a script consultant for Bailey Films and wrote and performed songs for “Dealing With Feelings” and “Communities”. As a writer, singer, accompanist and Music Director for the Troubadour Puppeteers (eight years) Patty performed in bi-lingual musical productions in Watts and East Los Angeles. She also worked in those communities for four years, as a CDA Head Start Trainer. (a preschool located in Ballard High School) in NVC, using music, stories, and puppetry. From 2008 through 2010, Patty trained the staff and parents in Nonviolent Communication at the Maria Montessori Language and Cultural Center at Ballard High School. Beginning in 1960 she traveled throughout Canada, parts of the U.S. and also Taiwan, leading teacher workshops, lecturing, and doing concerts. Her work has included universities, churches, parent education groups and other community organizations. A partial list includes: University of British Columbia, University of Hawaii, Greenriver Community College, Washington Association for the Education of Young Children, Kamloops and Kelowna Schools, Kingview Conference Center, Edmonds Community College, Santa Monica Community College, Maui Association for the Education of Young Children, Taipei Association for the Education of Young Children (Taiwan). Others: King County Library System, Burian Library, University of Southern California, Los Angeles City and County Schools, Long Beach State Collect, Northridge Valley College, Moorpark College, L. A. Unified Schools, Project Head Start, Santa Barbara Kindergarten Teachers Association, Music Teachers Association of California, Orff-Schulwerk Association, Hawaii Association for the Education of Young Children, l00 Mile House (Canada) Metropolitan Learning Center (Portland) Portland Public Schools, Stillmeadow Farms(Çanada) Åbbotsford College and University, Lake Washington Voc. Tech, Secret Garden Bookshop. The following are quotes from letters in response to her work. I have spoken with several people who attended your workshop last Saturday and they gave it rave reviews!! By all accounts, it was an outstanding workshop that greatly benefited the participants. This program was attended by 300 participants including teachers, education aides, teacher assistants, parent education teachers and Area/District Advisors. Your presentation was perfect in every respect. It provided essential background information, a demonstration of useful and practical ideas using recordings and audio-visual aids, and an opportunity for active participation. It was outstanding not only in content, but in its reflection of warmth, enthusiasm and professional spirit. It has been my pleasure to know and work with Patty Zeitlin for the past ten years. She is a dedicated professional, and an accomplished musician and writer. She has utilized her knowledge and understanding of young children and her artistic abilities in unusual and creative ways. I recommend her highly for any program. She brings a high degree of commitment, energy and experienced to any tasks she undertakes.